This vanity has both an all-around look and a modern style. With a beige tan marble counter and grey solid wood base, this piece is very stylish. Add a classic feel to your bathroom with this simple vanity set from Wyndham Collection. This vanity has both an all-around look and a modern style. Its beige tan marble counter and grey solid wood base will look beautiful in your home. The simple look of the double-door cabinet and drawers is useful and classic. This set from Wyndham Collection is great for anyone looking for great style and function in their bathroom. 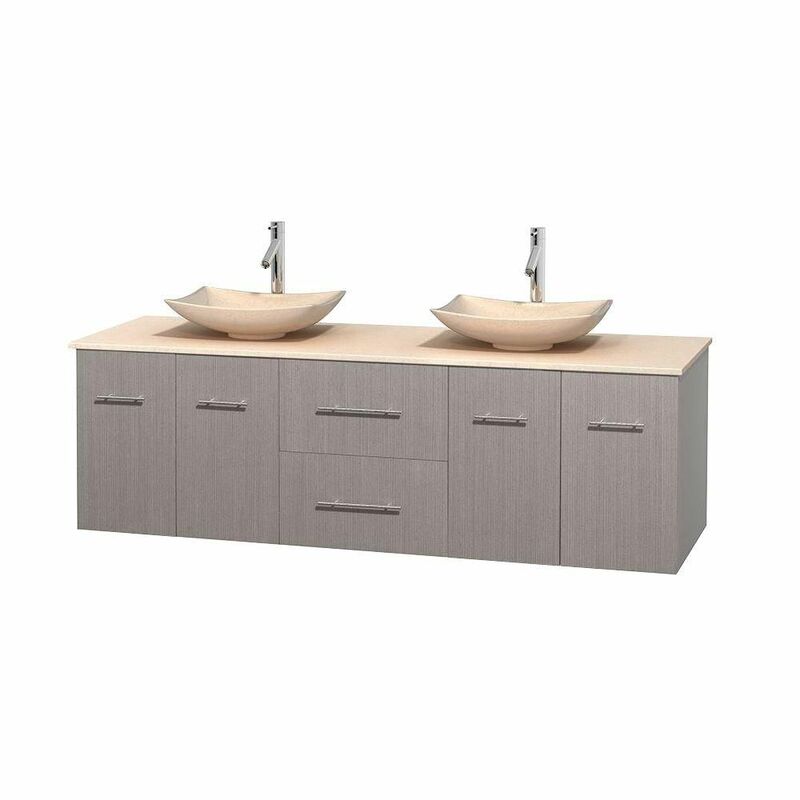 Centra 72-inch W 2-Drawer 4-Door Wall Mounted Vanity in Grey With Marble Top in Beige Tan, 2 Basins This vanity has both an all-around look and a modern style. With a beige tan marble counter and grey solid wood base, this piece is very stylish. Add a classic feel to your bathroom with this simple vanity set from Wyndham Collection. Centra 72-inch W 2-Drawer 4-Door Wall Mounted Vanity in Grey With Marble Top in Beige Tan, 2 Basins is rated 2.0 out of 5 by 1. Rated 2 out of 5 by Flog4food from It is more brown than the picture depicts. The craftsmanship is not very good. One of the drawe... It is more brown than the picture depicts. The craftsmanship is not very good. One of the drawer rails fell off and the rest of the screws were loose. The drawers hit each other when they shut so you had to push them in instead of them closing by themselves. There is no adjustment for the drawers like there is for the cupboards. We ended up putting shims in the top drawer to raise it up a little bit so the drawers wouldn't hit when closing. The quality is not what I would expect for something that cost this much.